I am the one in my household who, when a new bar is put in the soap dish, reaches for the small old bits of soap before grabbing the new one. I gather all of the little scraps from various soap dishes in the house and make one small bar by wetting the pieces of soap and pushing them together. This newly formed soap bar is then only used by me. 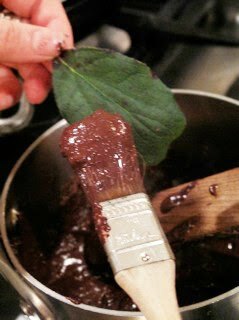 I was reminded of my hodge-podge soap bar this past weekend when I was preparing to make chocolate covered leaves with some organic (and expensive) dark chocolate chips from the co-op. I love organic dark chocolate, and I'll often have three to five different kinds stashed in my fridge at any given time, which I nibble whenever my sweet tooth gets a craving. As a result I have a growing collection of random chocolate pieces, wrapped up tightly in their individual wrappers. Why not apply the same line of thinking to the chocolate as I did the soap? So I put the dark chocolate chips away for another day, and pulled out my collection of chocolate bar bits instead. 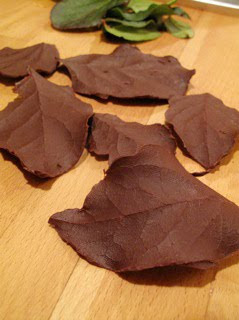 The chocolate leaves I made from them were delicious and easy to make. I started by collecting Salal leaves. They are hardy and plentiful here in the Pacific Northwest, and their thickness and stiffness make them ideal canvas upon which to paint thick layers of chocolate. I washed them gently and dried them with a towel. If using bits of chocolate (instead of chips), break them into small pieces. Next I heated up the bits of chocolate over low heat. You can use a double broiler, but there's no need to get fancy — just be sure to keep stirring to smooth out the lumps and prevent the chocolate from getting burned. Using a clean candy brush, paint the melted chocolate on one side of a leaf (the back or front side of leaf works equally well). Cover the leaf thoroughly and apply the chocolate fairly thick. There's no exact measuring here, but I found that if the layer was about 1/8" thick that I was less likely to crack the chocolate in Step 5, when peeling away the leaf. After the leaves are painted, place them flat on a tray (chocolate side up). Once all the leaves are done, move the tray into your freezer and leave it there for 30 minutes. Remove the tray from your freezer and peel the leaf away from the chocolate. Serve on top of red raspberry sorbet for Valentine's Day, or enjoy on them own. This would also be a good recipe to try with mint leaves, something I'll have to remember this summer when my garden is overflowing with it. 2/10/2011: Last day to place orders & receive by 2/14/11 via UPS Next-day Air Shipping. From now through 2/10/2011, 50% of profits from all Valentine items purchased on KataGolda.com will benefit Spoon's mission to improve the health of international orphans and adoptees. To learn more, visit SpoonFoundation.org.